Adobe Engineers are developing a new product codenamed Adobe Apollo that integrates the Macromedia Flash Player with the Adobe Acrobat PDF Reader. Adobe Apollo software will provide Macromedia Flash and HTML functionality and will run independent from the web browser just like a standalone desktop application. Adobe Apollo won't provide an EXE projector like you see for SWF files, instead clients will have to download and install the Apollo runtime. And just like Macromedia Flash, Adobe Apollo will be a free runtime. The pre-release version of Adobe Apollo will be available this year while Apollo 1.0 is expect in 2007. Apollo Version 1.0 will run on desktops while the future releases will support mobile devices. Apollo will offer data synchronization, the ability to work online or offline, one-click installation and desktop integration. Apollo will join Flash Lite (the mobile client) and Flash Player (the browser client) to form the Flash Platform client family. Adobe Apollo is seen as the next generation Flash player that run out of the browser and offers Macromedia Central client like capabilities. Meanwhile, Adobe will continue to deliver the standalone version Flash Player and Adobe Reader for viewing and interacting with PDF documents and forms. Applications for Adobe Apollo can be devloped in any IDE include Macromedia Flash Platform, Adobe Flex Builder (Zorn), Eclipse or even the good old notepad. To explain the potential of Apollo, Macromedia Senior Vice President Mike Sundermeyer presented a concept application where a user's entertainment library was fully indexed and integrated with ecommerce, email, messaging, media center and other dynamic content into one intuitive application. Adobe Apollo sounds quite like Macromedia Central, a application and deployment environment. Macromedia Central applications are written in Flash and can be run locally on the user desktop from a Macromedia Central shell client. Kevin Lynch said that Adobe Apollo will be posted on Macromedia (Adobe) Labs when it moves to alpha stage. It is now very clear that the Macromedia Flash Platform is not going to stay exclusively in web browsers. 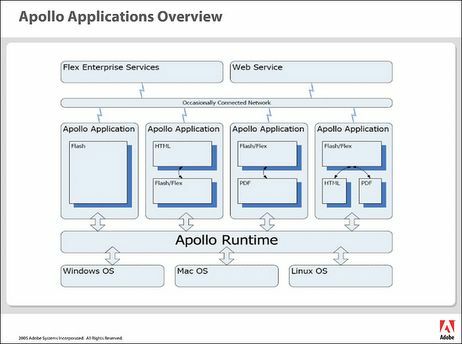 Ikezi Kamanu attended the Adobe Apollo technical overview session at Adobe Developer Week and he has posted screenshots with Technical Overview of Apollo. Ryan Stewart has some screen capture of demo applications built using Adobe Apollo and Flex Builder.